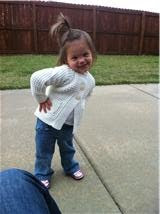 Lately this Sassy girl has been striking her sassy pose when I ask her to. I don't know where it came from and it normally only lasts two seconds. But I just think it is too cute for words! 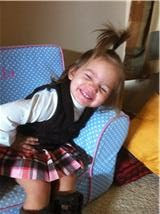 The sassy pose usually includes this SUPER cheesy smile with her eyes almost closed. 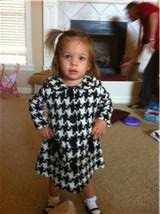 She loved wearing this coat but wasn't being super sassy before church, ha! 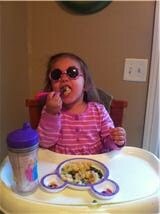 And yes, I would say at least 2 nights a week this little one sports her sunglasses while eating. What can I say...she's a star! Sorry for the bad quality of pictures, but Stella is a super busy body lately so these are normally captured on my phone before she's off to her next thing. Also, I'm going to work on being better at posting!